Trixie began as an idea for a small and simple to build plywood tender, able to get out to a mooring with two or three on board, that was very light, incorporated wheels to enable transport to the slipway, was designed to provide the maximum space from two sheets of 1/4" plywood, and could be powered by oars, a small outboard or sail. Simplicity and economy have been my main design criteria. The side panels have parallel long edges, 8' long - this ensures the least amount of wastage and makes for easy marking out and cutting. The bottom panel is 4' wide and of a length to suit the side panels. This produces a hull with a maximum beam of 4'6" and a length of 7'2". With proportions like this, she should be capable of carrying three people and provisions to the mother vessel. On the bottom are two skegs, each of which incorporate a 4" diameter plastic wheel. The intention here is to facilitate pulling the boat across a car park or road, and down a slipway. I doubt that they'd cope on sandy beaches or muddy tracks! Other options are to omit the wheels, or provide one central skeg (minus the wheel), or omit the skegs altogether. She's not going to win on the speed stakes - but I think that she looks cute! 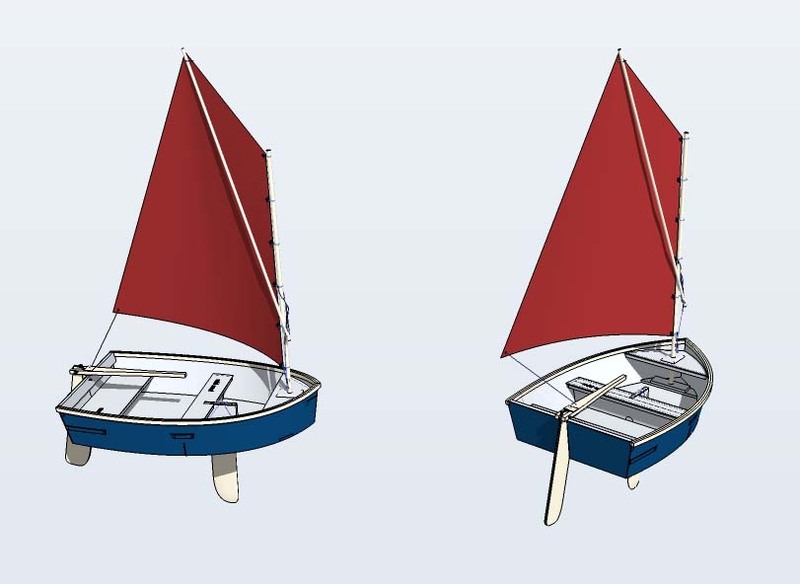 Having designed her, I decided to add a simple sail option, which is included as a supplement to the plans.